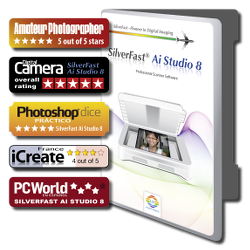 SilverFast has been developed for professional image processing as well as for beginners who enjoy their analog images and intend to keep them in digital form. SilverFast thus offers a dual interface for basic and expert settings which meets all expectations, as well as helpful QuickTime movies visualizing the use of the software. SilverFast is available for Mac and Windows and is usable as a stand-alone software, as well as a Photoshop plug-in. As part of the Archive Suite and our lossless RAW data concept, SilverFast saves your slides, filmstrips, Kodachrome pictures and fotos, with all data that can be captured, as RAW data image files. This may even include the infrared channel for later dust and scratch removal. Below you will find detailed information about each SilverFast version. You can also consult the product page for your scanner to look up, which software is available for your device and operating system. The entry-level version for uncomplicated and professional scanning offers easy handling and a variety of automatic functions. The basic SE version with additional important functionality for advanced users: Multi-Exposure, Kodachrome and some more features. The flagship of the SilverFast scanner software series now includes the Auto IT8 Calibration and meets the highest demands. Extensive complete package for the professional operation of the Heidelberg drum scanners under modern operating systems. SilverFast X-Ray is a special software version for an easy digitizing of medical and scientific x-ray films. This particular entry-level version offers intelligent automatic functions that are very easy to apply and QuickTime movies in every dialogue. The basic SE version with some special extras: Auto Frame Alignment, Multi-Exposure, Kodachrome features and many more. For serious and professional photographers SilverFast Ai offers enhanced functionality compared to SE without sacrificing ease of use. The Studio version is capable of meeting the highest standards. Full functionality, including Multi-Exposure. Automatic IT8 color calibration and ICC profiling of your scanner with just two mouseclicks.